A favorite fruit of kids and adults alike, bananas are a nutritious household staple. Bananas offer a host of vitamins, minerals, fiber, and healthy carbohydrates that make them the perfect breakfast food. Bananas come in different lengths. Like many foods, the nutrient content of bananas depends on its size, but all bananas are mostly made of carbohydrates. How Many Calories Are in One Banana? Small bananas are around 6 to 7 inches long. These bananas contain 90 calories, 23 grams of carbohydrate, 1.1 grams of protein, and 0.3 grams of fat. Small bananas also contain 2.6 grams of fiber and 12.35 grams of natural sugar. A medium banana measures about 7 to almost 8 inches long. A medium banana provides 105 calories, 29 grams of carbohydrate, 1.3 grams of protein, and 0.4 grams of fat. The fiber content of a medium banana is 3.1 grams and the natural sugar found in this banana is 14.4 grams. Bananas found at the store are typically large bananas which range from 8 to almost 9 inches long. These bananas have 121 calories, 31 grams of carbohydrate, 1.5 grams of protein, and 0.5 grams of fat. Large bananas also provide 3.5 grams of fiber and 16.6 grams of natural sugar. Not only do bananas provide healthy carbohydrates and fiber, but they are also great sources of many vitamins and minerals. Bananas are good sources of potassium, vitamin C, vitamin B-6, and fiber, and are sources of riboflavin, magnesium, iron, and vitamin A. 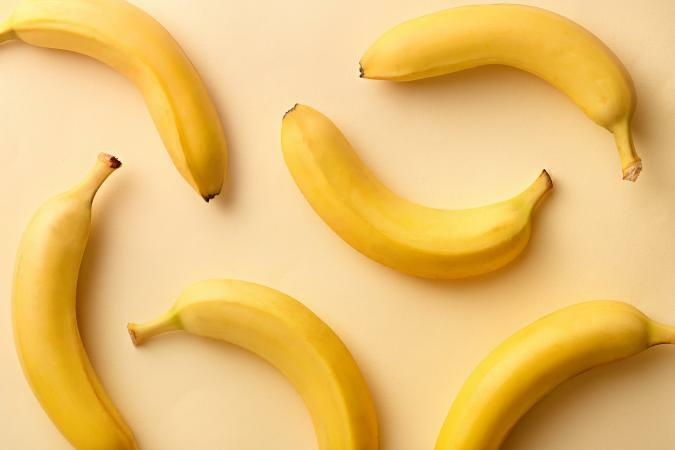 Are bananas healthy for you? Absolutely. Bananas are a nutrient dense fruit full of healthy carbohydrates, fiber, potassium, vitamin C, and many other vitamins and minerals. No matter the size you purchase, bananas are a great fruit to incorporate into your meals.